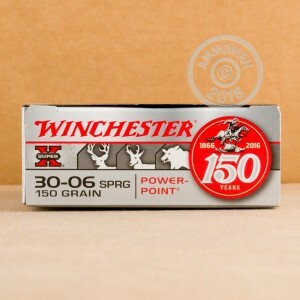 This .30-06 Springfield ammunition from Winchester is a dependable hunting load firing a 150 grain "Power Point" nothced soft point bullet designed for fast, deadly expansion without heavy fragmentation. 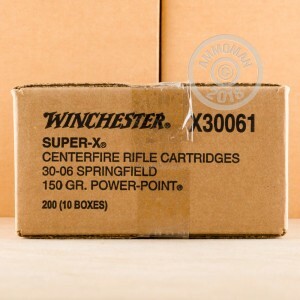 Winchester ammunition has enjoyed a strong reputation for well over a century and continues to provide excellent performance to target, hunting, self-defense, military, and law enforcement users. It has been manufactured in many places throughout the company's long history, but is now made in Oxford, Mississippi, where a state of the art facility opened in 2011. 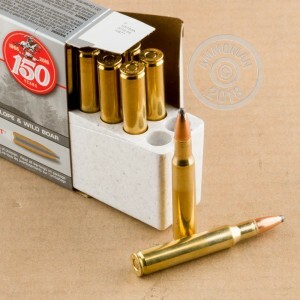 This ammo uses non-corrosive Boxer primers and brass cases and comes in boxes of 20. Remember to take advantage of AmmoMan.com's free shipping discount for all orders over $99!